Gruesome images posted on Twitter and YouTube show the devastating impact of a flash-flood that has killed at least 58 people in Salgar, Colombia. 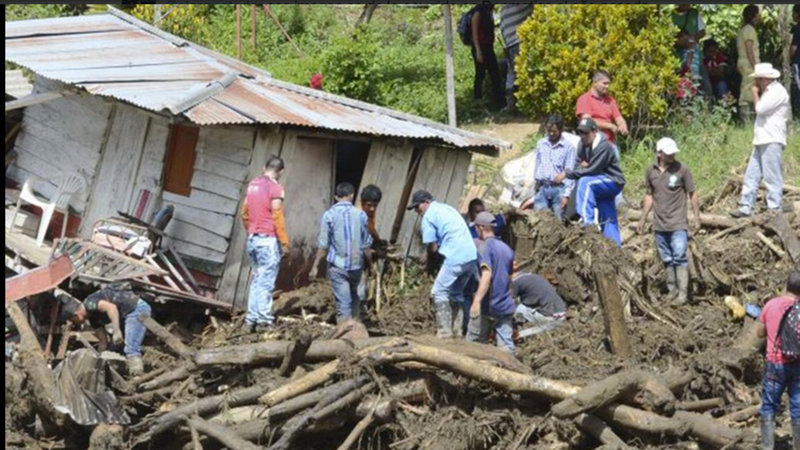 The western Colombia municipality awoke a 3 a.m. this morning to torrents of water and mud sweeping through town after overflowing the banks of a local river, burying homes, cars, people and everything else in its path. The death count climbed steadily and gruesomely throughout the day, reaching 58 bodies by this evening. As the town digs out, Colombian President Juan Manuel Santos said one of his government's top priorities is to move the uncovered corpses three hours away to Medellin, because Salgar lacks the proper facilities to store so many corpses at once. "We don't have cold rooms to store them here, it would be a disaster to leave them here," Santos said during a brief visit to the area. The death toll could be much higher by Wednesday. There are still 120 people unaccounted for, according to officials. The Red Cross and Colombia's National Police are working through the night to find missing people, and attend those who have lost their homes. The Colombian government has so far declined to ask for international help. As the search for survivors continues, residents have started to post videos to YouTube. Local officials area also turning to social media to show the damage in the town. Here's a pic posted by the state governor of Antioquia, home to Salgar. According to Juan Martin Vazquez, the mayor of the nearby town of Tamesis, one of the greatest needs in Salgar right now is drinking water. "The avalanche took down some of the piping of the aqueduct. They urgently need drinking water there, and are storing it at the hospital," Vazquez told a local radio station.